Director: Claude Lelouch. 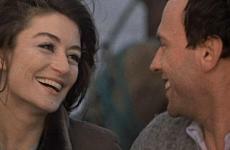 Cast: Anouk Aimée, Jean-Louis Trintignant, Pierre Barouh, Valérie Legrange, Simone Paris. Screenplay: Claude Lelouch and Pierre Uytterhoeven. One of the films I am most eager to catch up with in 2003 is the compendium project 11'09"01, in which eleven internationally prominent film directors were asked by French financiers to make a nine-minute-and-eleven-second short film that in some way addressed the destruction of the World Trade Center towers and its various global aftermaths. Even if, according to early reviews, the results are aesthetically uneven, the assembled talent is impressive, with participants ranging from established masters like Japan's Shohei Imamura and Egypt's Youssef Chahine to thrilling new talents like Samira Makhmalbaf (Blackboards) and Alejandro González Iñárritu (Amores perros). The most surprising invitee to this anthology is the Frenchman Claude Lelouch. Despite having made more than 30 features in his career, Lelouch's critical and popular notoriety is founded almost exclusively on two bases: A Man and a Woman, his prizewinning international hit from 1966, and the bald-faced, even embarrassing nostalgia with which Lelouch has sought to duplicate that picture (and its box-office success) at later stages in his career. Lelouch's repetition compulsion follows a strict ten-year cycle: viz. 1977's Another Man, Another Chance, 1986's A Man and a Woman: 20 Years Later, 1996's Men, Women: A User's Guide. Every once in a while, there's a spike in the pattern. His 1995 remake and revision of Les Misérables, starring Jean-Paul Belmondo, generated some popular and critical interest, with at least some surface departures from the usual Lelouch recipe. Despite such anomalies, he is not an artist who inspires much allegiance or interest; Lelouch and his signature aesthetic, cicada-like, can be relied upon to lie buried for years at a time, virtually forgotten, awakening only idle curiosity when they eventually and briefly re-emerge. It goes without saying that there are several French directors whose reactions to terrorist attack and international anxiety would command more interest than Lelouch's: Claire Denis comes immediately to mind, and Erick Zonca, Jacques Audiard, Mathieu Kassovitz, and Laurent Cantet follow shortly behind. So, too, does Godard, but after In Praise of Love, we can hardly doubt the basic tenor of his response. Lelouch, romantic idealist that he is, has a cuddlier sensibility than any of these artists, and it does not seem coincidental, though it may seem cowardly, that 11'09"01's French producers would make such a soft choice from among their own country's available talent. Perhaps others were solicited and declined to participatein many minds, the only ethical response to a proposition that followed the events of 9/11 so swiftly, and which therefore could not avoid a degree of opportunistic festival-circuit commodification as a kind of greatest-hits package of star auteurs. I will likely need to wait several months before the touring prints of 11'09"01 make their way to Ithaca, so that I can judge Lelouch's contributionwhich, I must admit, sounds dubious on paper: a deaf woman finds love and happiness after clearing up a romantic misunderstanding, oblivious all the while to the news reports echoing from her TV of the Towers' collapse. But, curiosity having killed the chat, I did finally go out and rent A Man and a Woman, to see what movie a guy can make in 1966 and still be reaping residual praise and opportunities four decades later. The answer is . . . almost no film at all. A Man and a Woman isn't boring, exactly, though nothing much happens, and it isn't quite vapid, though vapidity is perpetually within reach. It is an emblem of that same vein of mid-1960s cinema that blatantly ripped off the tricks of the French New Wave (fizzy editing rhythms, intensely self-regarding characters) and recycled them as "daring" entertainment for middlebrow hipsters. If Darling is the perfect English-language embodiment of this speciesall flash-cuts and fashion models, signifying nothingthen A Man and a Woman is the appropriate Gallic counterpart, a little moonier and turned down at the mouth, but cheery nonetheless as it gift-wraps the agonies and ecstasies of impish, beautiful people with kooky jobs and private pains in the shiny paper of gorgeously superficial imagery. Anouk Aimée, her eyes as inviting as her brows are haughty, is a single Parisian mother who makes weekly visits to her young daughter in a Deauville boarding school. Jean-Louis Trintignant, thirty years before Krzysztof Kieslowski's Red, is a race-car driver whose young son attends the same school as Anouk's daughter. Don't even ask me the names of the characters played by Anouk or Jean-Louis. As its title implies, A Man and a Woman is really only interested in certain aspects of these people, about which it assumes we are all in total agreement. Jean-Louis is a Man, and therefore thrill-seeking, confident, amiable, lusty, capable of going from zero to infatuated at the blink of a long female lash. Anouk is a Woman, and therefore totally mysterious, vaguely sad, helplessly beautiful, suppressing great secrets, game for a roll in the hay (where some poor fool will try, but fail, to penetrate her Secret). For most of A Man and a Woman, these archetypes just bop around. Then, in the last 15 minutes, Lelouch decides to spice things up with a little dramatic conflict: we, plus Jean-Louis, appear to discover the core of Anouk's melancholy. This changes everything. People are quickly ferried to train stations, where painful separations ensue. But lo! At a piquant moment during said separation, Anouk corrects Jean-Louis' misunderstanding of her Secret. This changes everything back. Hence, immediately after the plot-imposed separation, the lovers are reunited, and Lelouch's camera (he serves as his own cinematographer) is free to orbit at mach speed around the reunited couple, careening like the giddiest of all satellites, snapping precious, celestial images of the planet Romance. On the surface, where indeed everything about A Man and a Woman transpires, there seems to be a contradiction between the ardent humanism of the story and characterizations and the showcased stylistics of the direction. We have here a two-hander love story that couldn't be simpler: there are fewer than ten speaking parts, and even fewer narrative incidents. The children, having served their purpose in introducing the lovers, are quickly whisked offstage; boarding school is ambrosia for any screenwriter saddled with second-generation characters he doesn't really care about. And yet, protective as he is of his lovers' privacy, Lelouch reminds us repeatedly of his lenswork, his own intrusion into Anouk and Jean-Louis' intimacy. The telephoto snapshots and glamorizing verve of the editing cannot help but turn this mundane love-match into some kind of cosmic verity about the genders. And so, the movie's brisk and unpretentious spirit becomes just another form of pride and distance. With or without us, the film keeps going slackjawed at itself: at its economy, its shimmer of cool (race cars! films within films!). One can feel Lelouch beside himself that Anouk Aimée can look so lazily beautiful from every possible camera angle. In truth, this really is a wonder, but the film pushes the envelope, conning us that such beauty itself constitutes some kind of "story." That Lelouch and collaborator Pierre Uytterhoeven copped a Best Original Screenplay Oscar for "writing" this loosy-goosiest of films is its own form of grifterism. Best Original Song: "A Man and a Woman"